We live in a 3-level townhouse, so our basement (that 1st level) is a very important part of our living space. For the first few years that we lived here, it was a dark dungeon-like storage room (which is often what people think of when they hear the word “basement”). Luckily, we renovated the basement as our first big home project so that it could be useable space for toys and the TV along with needed storage and office space. Our basement has gone through many stages over the last 18 years. Although we’ve continued to store games and books and toys for ALL ages (the kids have spent many hours playing down there! ), we no longer need that kind of space with a house full of teenagers. We recently undertook a huge project to make our main basement room into the LuLaRoe boutique (you can join me in my Facebook group or send me a message if you want to learn more or shop!). No more couch, no more big entertainment center, and no more self full of picture books and toys. It’s a major transformation! Your basement may have a different function than ours. Maybe you’re used to using basements simply for long-term storage. 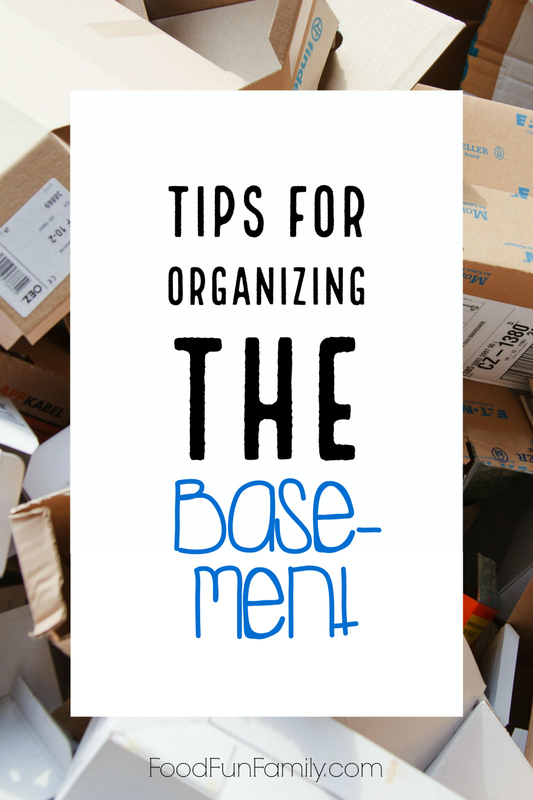 If your basement is out of control and full of stuff, then it is time to get it organized. Organizing your basement may not be at the top of your to-do list, but this is your year to get things organized. Here are a few tips for organizing a basement. Note: Amazon affiliate links are used within this post. There is no possible way to organize a basement (or any other area of the house, for that matter) when it is full of junk. Your first step in gaining control of the basement is to spend some time getting rid of everything you are not using. While you may think you will need something later, keep in mind that the space is something you need now. You will be happy once you get the junk out and have room for space for the family. I always look at things we’ve been storing or holding on to and ask myself 1) does it have sentimental/historical value? and 2) is it replaceable? When organizing, I always do a second look of the things I plan on keeping. Do I really need to keep it? What am I saving this item for? A double check on the item can help determine if I really need it or not. I need all the space I can get, so this step is extra helpful. When organizing a basement, especially when it’s a space you don’t go into as much as the rest of your house, labeling is a must. You can buy a labeling machine cheap, and I know you will get your money’s worth. It’s well worth it to stay organized! If you do not want to buy a label maker, paper labels from the Dollar Tree will do the trick. This is just a little trick I learned over the years. Keep everything in your basement off the floor as much as possible. Not only does it keep things more organized, but it helps protect your items. Since the basement is the lowest level of the house, you never know what can make its way indoors. Your best bet is to use shelves for items and to hang up as much as you can. I personally think it is much easier to keep things organized when you are not putting everything on the floor. This tip applies to any section of the house. When putting things away, make sure you’ve given everything a “home.” As you’re maintaining your organized space and cleaning up on a regular basis, it’s so much easier for the whole family to know where to put things away versus searching for an empty shelf or nook to stuff it. This step helps when looking for things, too. If you know where items belong, then finding things is as simple as walking downstairs and grabbing them off the shelf. It saves time in the long run! What tips do you have for organizing a basement? Removing the junk and labeling items are two of my favorite tips. Don’t be shy about sharing your tips with me!